Drew had his first physical therapy appointment this afternoon and, all in all, it went really well. It was Drew’s second outing since the surgery and today has been the best day since the surgery. Drew’s pain is minimal, he’s happy and joking around, and while Drew still isn’t very comfortable with anyone touching his fixator, he is more easily moved and adjusted. Of course, this may have something to do with us medicating him with pain relievers shortly before the appointment strategically. 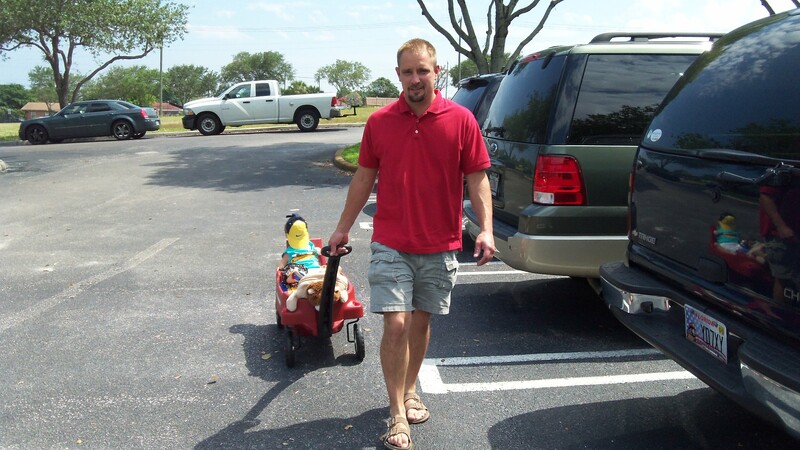 And, Drew looks so cute being pulled behind in a Radio Flyer wagon! While we waited in the waiting room, the room was inundated with painful screams and agonizing moans from patients undergoing therapy. It was so difficult listening to those poor kids in that much pain. And, to sit there and listen to it as you are waiting your turn! Talk about anxiety! Poor kids waiting! It must be worse than a dentist office visit. It was with much anxiety that they called Drew back into the torture chamber therapy room. They started with measuring his leg’s angles, rotations and extensions. They did some stretching in his hips to help release the soft tissue problems that Dr. Paley had identified (it was originally thought that Drew had in his upper leg, but turns out that soft tissue is pulling his leg into a rotation as opposed to the actual bone being misplaced. Hopefully therapy can repair this so Dr. Paley doesn’t have to perform additional surgery.) 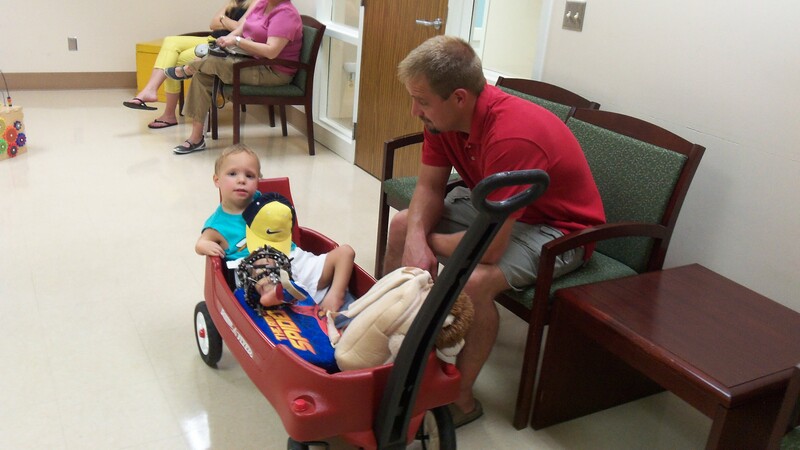 Drew certainly wasn’t happy and was in mild pain complete with tears, but it was for a very short period of time. I think they were taking it slow with him being his first appointment so I don’t anticipate the “walk in the park” forever. First obstacle: cleared. Second, we had to do the first “turning of the pins.” I couldn’t help but dread this as I can only imagine what it’s like to have screws twisted in such a way that it rotates your bone. We were handed a chart and were explained how the process works. Drew has “struts” that connect the rings together, a total of 12. He has a total of three rings: 2 below the knee and 1 above the knee and there are six “struts” that connect each ring. The “struts” are bolted into the rings in varying angles and lengths. Drew has about 13 pin sites where a pin of varying thickness impale his leg. The “struts” are adjusted daily using a scale to a specific measurement indicated on the chart. The adjustments are millimeters, very, very tiny movements. The chart is a simple table with a daily number for each strut. I couldn’t help but admire the fact that a team of surgeons and computer software can come up with an adjustment so small over a period of time, each going in different directions and varying increments, to straighten the leg in the perfect angle. It was a simple procedure: strut 1 turn clockwise (if the increment increased), strut 2 counter-clockwise (if the increment decreased.) Simple as that. And, Drew didn’t object to whole-heartedly during the process. So, yay!